Is it currently possible to travel directly between Egypt and Israel, preferably by land? If so, is there a preferable sequence: e.g. Egypt before Israel? My son (25) and I are considering a trip to this region and we would like to visit both countries. We could travel on either UK or Irish passports though we would not normally take both on one trip. The travel does not need to be very comfortable or easy. We are both used to roughing it. I would prefer a tough but interesting land journey than a quick and easy but boring flight. I almost entered Israel from Egypt using the Taba/Eilat border crossing Michael Seifert mentions in his answer in 2016. In that year, there was a local bus connecting central Eilat to the crossing; I strongly assume that it still exists because it also connects places such as the underwater observatory to the town centre. So on the Israeli side, there should be no problem getting into town and getting onwards. Note that if you plan on renting cars make note that you will very probably have to rent a different one on each side of the border. Israel and Egypt have signed a peace treaty and otherwise have diplomatic relations with each other; much like Israel and Jordan. So there are no difficulties when travelling between those three countries. Note, however, that having an Israeli stamp in your passport will stop you travelling to a number of countries. In the eyes of these countries, even an Egyptian exit stamp from Taba will be evidence that you have visited Israel making you unadmissable in their eyes. This is less of a problem to you because you have two nationalities and hence two passports. I would strongly recommend you to choose one only for the trip and to make sure you don’t intend to travel to any of those countries on that same passport. Other than that, I am not aware of any different treatments of British and Irish citizens in Egypt or Israel that would tip the decision in favour of one or the other. Finally, I wish to come back to my first sentence in which I said almost. In the end, my group’s trip which was planned to be Jordan–Egypt–Israel was rerouted to become just Jordan–Israel. The reason for this being the presence of terrorist groups such as Al-Qaeda and IS on the Sinai peninsula. I am not sure what the current situation is like, but I strongly suggest acquiring as much information as possible on the Sinai peninsula from travel agencies and/or government sources. 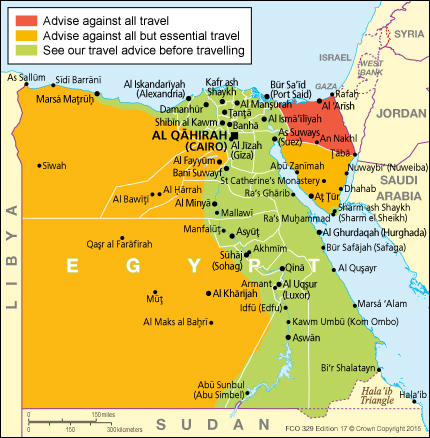 For example, the German foreign ministry has issued a travel warning for the Sinai peninsula (in German). This travel warning explicitly states that one should not attempt tours on one’s own. (‘Von Überlandfahrten ohne ortskundige Begleitung wird dringend abgeraten.’) Likewise, they explicitly recommend not to visit any parts of the peninsula other than the East coast strip (‘Von Fahrten abseits des Küstenstreifens […] wird gänzlich abgeraten.’). I myself am German, so I knew immediately where to find German sources and recommendations. Since you are a British citizen, the advice given by the UK government and found in Tim’s answer along with the links therein may be even more relevant. While details of the recommendations may differ, the general picture of the advice should stay the same. Of course, it’s your choice in the end but do consider that it may be more than just rough. Opened on April 26, 1982 it is currently the only entry/exit point between the two countries that handles tourists. ... The terminal is open 24 hours a day, every day of the year except for the holidays of Eid ul-Adha and Yom Kippur. Wikitravel notes that there are twice-weekly bus services from Cairo to either Tel Aviv or Jerusalem, switching buses at the border. However, they note that the bus company operating these routes is not always reliable. Finally, note that this border crossing is occasionally closed due to external events; for example, the crossing was briefly closed to Israelis after terror attacks in Egypt in April 2017. (Foreign nationals were still allowed to cross during this time, and the crossing re-opened to Israelis 11 days later.) It would be advisable to have backup travel plans of some kind should such a closure occur during your trip. As the other answers say, you can make this crossing. However, the U.K. government provides travel advice for many areas of the world. The advice for Egypt is here. You can cross either way through the Taba crossing, between Eilat and Sinai. See the crossing's (Israeli side) web site. So you can travel from anywhere in Israel to Eilat, cross to Sinai, visit the beautiful beaches and mountains, then proceed to the rest of Egypt, or vice versa. I see no preference to either order. Between Eilat and Taba you can use Egged bus #15 or taxi. "East Delta Travel" Buses to Santa Caterina, Sharm El Sheich or Cairo - only a few daily buses. Taxi - you share it with other passengers, it leaves when full. Passport stamps are an issue if you intend to travel countries hostile to Israel, Jan's answer covers this well. Do note, they no longer stamp your passport in Israel but instead give you a slip that you can tuck away; if you stop in Jordan the Egyptian border will assume you were only in Jordan, though they may ask if you've been in Israel. You can expect a lot of questions at Ben Gurion if you are traveling to other parts of the region on your trip. I was detained for about an hour as they wondered why I was going to the other countries and had a hard time wrapping their heads around the fact that I have family living in both Jordan and Egypt. I had an amazing trip and wish you the same! Not the answer you're looking for? Browse other questions tagged israel egypt or ask your own question. It is safe to travel in Israel and Palestine? What are some unique opportunities and lodging in Siwa Oasis, Egypt?